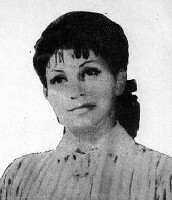 The soprano, Liliana Bareva, was born 15 April 1922 in Sofia. She studied at the State Academy of Music as a student of Ludmila Prokopova. In 1945 she was awarded the Gold Medal for Youth and Art in Bulgaria. Again in 1948 she won first prize in the First Bulgarian Competition for Instrumentalists and Singers. In 1946 she became a member of the Sofia National Opera with her debut being on June 4, 1946 as Violetta. International appearances followed in Russia, Hungary, Poland and Albania. In 1961 she appeared as a soloist with the Berlin State Opera. Roles in her career included Violetta, Mimi, Manon, Michaela, Gilda, Pamina, Konstanza, Cherubino, Donna Elvira and leading roles in many Bulgarian operas.